This cute chicken can be made as a dish rag or a pot holder. 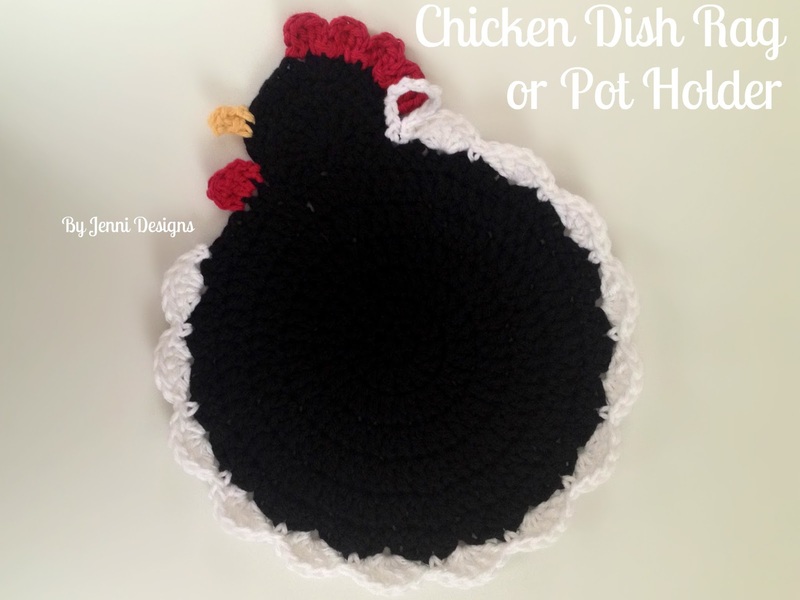 The pattern is written for the dish rag option but here’s what I do to use it as a pot holder: First I crochet two complete chicken body/heads then I sew them together around the edges. After they are sewn together move on to the wattle, feathers, comb and beak working your stitches through all four loops of both bodies. 100% Cotton Worsted Weight Yarn, approx. 150 yds. -It’s important that you use 100% cotton yarn if you are planning to use this to set hot pans on, acrylic will melt if you set a hot pan on it. -Ch 1’s & 2’s do NOT count as a stitch and are not counted in the end of row stitch count. -Join to the first stitch in the row, NOT the beginning chain. -Stitches listed between these brackets: [ ] should all be worked in to the same space. Row 8: Ch 1, sc in same, skip 2, in next stitch: [3 dc, 2 tr, 3 dc], Skip 2, sl st in next. Ch 1, turn. Row 9: Sc in same, hdc in 3, 2 hdc in next 3, hdc in 2, sc in last. Ch 1, turn. Row 10: Do not work in same, sc in next, hdc in 3, 2 hdc in next 3, hdc in 2, sc in next 2, sl st in last, sl st into next open stitch on the body. Fasten off and sew in ends. The side currently facing you is the RS (right side), all the remaining details should be added when RS is facing you. At this point if you have decided you would like your pot holder to be double thick and you have made 2 bodies, sew them together just below the loops. You will still need to work along the edges of the body to add the remaining details. When you move on make sure you are working through the loops on both bodies. Join with a sl st in the same space as you just fastened off for the body/head. Row 1: Ch 1, 2 hdc in next, hdc in next. Ch 1, turn. Row 2: Hdc in same, sl st in 2. Fasten off, knot these two ends together then sew them in. Note: If you do not want a loop for hanging, fasten off before ch 10 at the very end of row. Skip 3 spaces from where you fastened off for the wattle and join with a sl st in the next space (leave 3 spaces unworked).The feathers will be worked over the next 71 spaces. Double check count before starting, if you missed a stitch somewhere and only have 70 (for example) you may need to skip only 2 spaces. It’s always good to double check before starting. Ch 1, *sk 1, 5 dc in next, sk 2, sc in next* repeat *to* 12 more times for (13 feathers made). Sk 1, 5 dc in next, sk 2, sl st in last, ch 10 and sl st in same space. Join with a sl st on top of the head in the space all the way to the right. *Ch 2, dc in same, in next space: [dc, ch 2, sl st into same], sl st in next. * Repeat *to* 3 more times (4 made). Fasten off and sew in ends. With yellow join with a sl st in the 5th stitch from where you just fastened off with red for the comb. [Ch 2, dc], fasten off and sew in ends. With tapestry needle, stitch on a little eye above the beak. I usually leave this off of the pot holders I make that are only one layer because I don’t like that the end can’t be hidden easily. Maybe a small wooden button would work well, a plastic button may melt if a very hot pan is placed on the pot holder. I love it! I even know who I'm making it for! Do you stitch together all the way around head also when joining to together? Yes Tammy, that is correct.